The L2-Farside Mission, a mission to the moon's far side depicted here, is being championed by builder of the Orion spacecraft, Lockheed Martin Space Systems. It is seen as an intermediate step toward more challenging missions beyond low Earth orbit. Shown here is how an astronaut crew would teleoperate robots on the lunar surface. 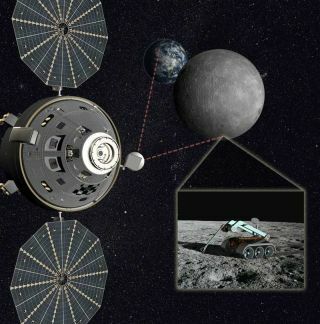 WhileNASA has officially given up its plans to send humans back to the surface ofthe moon anytime soon, a contractor is proposing a mission to send a crew to astationary spot in orbit over the far side of Earth's neighbor. Thecompany says such an endeavor could sharpen skills and technologies needed fora trip to an asteroid ? as well as showcase techniques useful for exploringMars by teleoperation as astronauts orbit the red planet. Both are stated goalsunder the new direction for NASA outlined by President Obama. LastFebruary, the White House issued its proposed NASA budget that aced out formerPresident George W. Bush's Constellation program. That plan had benchmarked2020 as the date to replant the feet of U.S. astronauts on the moon after thelast set of moonwalkers departed the landscape back in 1972. Instead,President Obama laid out the goal of sendingastronauts beyond the moon and into deep space. He aimed to land people onan asteroid for the first time in history by 2025, and send a crew to Mars bythe mid-2030s. Spaceplanners at Lockheed Martin Space Systems in Denver proposed using theirOrion capsule to support an L2 farside moon mission ? one that allows an astronaut crew to have continuousline-of-sight visibility to both the entire farside of the moon and Earth. Thecrewmembers aboard NASA'sApollo 8 missionin 1968 were the first to set human eyes on that hidden real estate permanently turned away from the Earth. TheEarth-moon L2 Lagrange point is where the combined gravity of the Earth and themoon allows a spacecraft to hover over onespot and be synchronized with the moon in its orbit around the Earth. "Wehave come up with a sequence of missions that we've named 'Stepping Stones,'which begins with flights in low Earth orbit and incrementally builds towards ahuman mission to the moons of Mars in the 2030s," said Josh Hopkins ofLockheed Martin's Human Spaceflight Advanced Programs department. The firstOrion missions to the moon's far side, viewed as feasible by 2016 to 2018,would accomplish science goals on the lunar surface using robotic roverscontrolled by astronauts in space "as practice for doing the same thing atMars," Hopkins told SPACE.com. Hopkinssaid that the L2 missions would also be a "shakedown cruise" topractice medium duration missions and the higher-speed reentry needed forexploration missions before the next step - missions to asteroids. Those inturn, he added, demonstrate additional capabilities for longer and more distantexploration before the Mars orbit mission. Astronauts on an L2-Farside mission would travel 15 percent farther from Earth than the Apollo astronauts did - and spend almost three times longer in deep space. Each flight would prove out the Orion capsule's life support systems for one-month duration missions before attempting a six-month-long asteroid mission. It would demonstrate the high speed reentry capability needed for return from the moon or deep space ? 40 percent to 50 percent faster than reentry from low-Earth orbit. The mission would measure astronauts' radiation dose from cosmic rays and solar flares to verify that Orion provides sufficient protection, as it is designed to do. Currently the medical effects of deep space radiation are not well understood, so a one-month mission would improve our understanding without exposing astronauts to excessive risk. Asscripted by mission designers at the aerospace firm, the mission plan isstraightforward, performed using new or existing rockets and a configuration ofOrion designed for lunar missions. Toland unmanned spacecraft on the surface of the moon's farside, NASA would haveto develop a new moon lander, since plans for theAltair human moon lander under the Constellationprogram were axed. Therobotic lander and rover would be launched first on aslow but efficient trajectory to the moon, to ensure that the rover is on itsway before risking the crew launch. Next,three astronauts would be launched in an Orion spacecraft. If NASA has built aheavy lift launch vehicle by then, it would be capable of launching the crewdirectly to the moon. If thatmega-booster is a no-show, smaller rockets can be used instead, but a more complexarrangement would be required. First,Orion would be launched to low-Earth orbit on a rocket such as a Delta 4 Heavy.Then, a modified Centaur upper stage would launch on a separate rocket. Orionwould dock to the Centaur stage in orbit, and the Centaur would boost Oriontoward the moon. Usingeither launch method, Orion would fly past the moon for a gravity slingshotmaneuver toward the L2 point. Orion would use its propulsion system to enter ahalo orbit around the L2 point. Once atthis vantage point ? 40,000 miles above the far side of the moon ? the Orioncrew would be able to see both the entire far side of the moon, and the Earth. From thisunique slot in space, astronauts would control robots to perform various lunarduties. Astronauts would orbit the L2 point for about two weeks ? longenough to operate a rover through the full length of a lunar day.